Inshore Holes, Rip Currents... And SAND BARS !!! Yesterday, while touring Southern Section Headquarters with a first aid assist from So. Section Chief, Charlie Kissel, we were informed of rescues being made by southern section lifeguards, with large surf, and riptides. 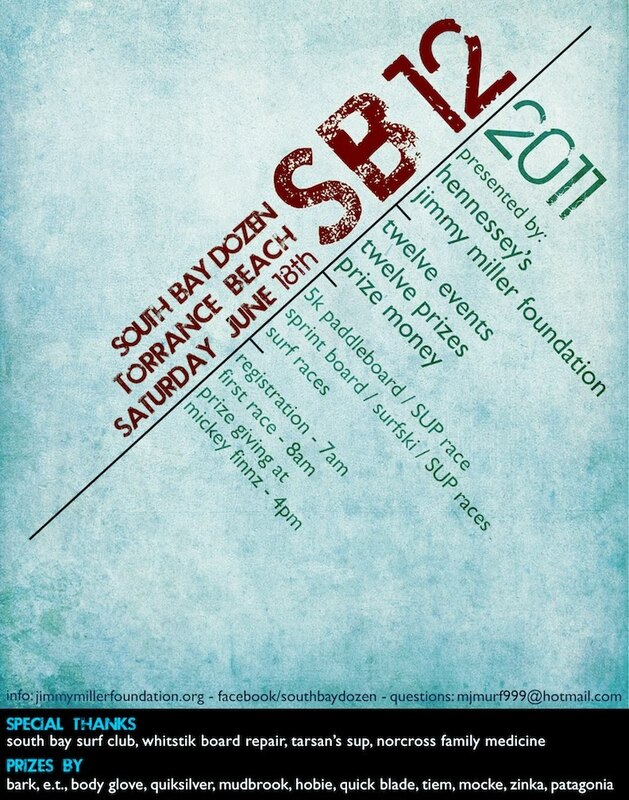 The beach bottom is also torn up in the south bay. We've amended or edited our previous shout out regarding Inshore Holes and Rips to include SAND BARS. Yesterday morning, prior to our SSHQ visit, the undersigned went for a swim at the Training Center out front in the surf at 2600 Strand, Manhattan Beach, in order to get a sense of the terrain and conditions in advance of our scheduled annual recheck swim. At approximately 100 yards offshore adjacent to the first recheck buoy, we encountered (forehead and nose first) a sand bar 3 to 4 feet deep after having just swum in 10 foot deep water. While diving under an approaching large wave the abrasions to the nose and forehead are a HUGE REMINDER to ALWAYS keep your hands out in front of you while not only dolphining in the shallows BUT ALSO even out past where you think it is deep. In Manhattan Beach adjacent to 2600 Strand, at least, with its pronounced downward sloping beach and mulitiple breaking points, you just never know where you will encounter a SAND BAR. SO KEEP THOSE ARMS OUT IN FRONT OF YOU AND BELOW YOUR HEAD AND SHOULDERS... EVEN WAY OFFSHORE ! Do you remember Burnside's "Keep the Kitchen Clean" speech...circa 1962. He called a mandatory 8am Sunday meeting for all lifeguards on schedule... dormies or not and you were required to attend even if Sunday was your day off. Bernstein went on for hours...blah, blah, blah about how the Zuma HQ/Dorms was also a place of work and that the public came through on their way upstairs to the former veranda switchboard area and office. I think he might have also covered kitchen hygiene because we know how obsessive-compulsive all permanent lifeguard staff have always been. After his hour-long rant about keeping the kitchen and downstairs clean......he asked if there were any questions. Tom Landis raised his hand...Bob said, "Yes tom"...Tom said..."Don't you have to allow for some HUMAN ERROR." Bernstein almost blew a chamber... his dark skin turned dark red. I think it would have been a more meaningful speech if Burnside had incorporated athletic heroes like Sandy Koufax, Don Drysdale, Johnny Unitas and Norm VanBrocklin etc. and told us they were people who kept their kitchens clean. We all felt we had "Chinks In Our Armor" by not keeping the kitchen clean. (File under:) "Keep the Kitchen Kleen/Human Error Speech"
organic vegetarian South Bay lifeguard. Oh yeah I almost forgot...because Lt. Burnside attended Black Fox Military Academy... he taught us all how to make our beds (bunks)... so that a quarter would bounce off the sheets. I always just slept with my own blanket covering me on top of the LACo issue wool blanket and sheets... so they always passed muster... I just straightened the bed up a little before going downstairs in the morning for breakfast and to read the L.A. Times for the others. I never learned how to make my bed the Burnside military way. I barely knew how to wash my lifeguard tower windows... my now former brother-in-law Wally Millican taught how to properly wash lifeguard tower windows. Wally also suffers from obsessive-compulsive disorder... OCD. If you ever got to work Coral Beach or even if you didn't... across the highway was an all the pancakes you can eat diner. Eventually they called-off the deal...too many guys were eating up all their batter... mainly Dave Rochlen. I think they had dollar bills on their walls and ceiling in place of wallpaper. I found out later...and we were too dumb to know there was a college located in Westwood. Many Thanks to Larry for the many laughs! Hopefully, Larry will send us more stories and rest of you guys and gals will send us stories too to publish to keep our group entertained. ZUMA + SURF = RIPS!... BIG RIPS!!! (Photo source/info, per Bob Burnside: The attached photo (above) shows (my son) Bobby in Tower 4 at Zuma with Don Bane, a seasonal guard. This was the time frame of the rescue (in the story below). Just in from Chief Bob Burnside, Ret., an absolutely heart warming story from "back in the day" at Zuma during a huge swell that involved his, at that time, 9 year old son, Bobby, who was a Zuma Junior Lifeguard at the time. It is such a delightful story that we just HAD TO SHARE it with you all. So here goes... just as we received it. "Will... Not necessarily be of blog interest... but I also came across this in my bio. About my son Bobby... To those that have never seen Zuma with a big southern swell... and a radical running lateral current...they have missed some days of exciting rescues... If you have never experienced this... When it goes off...call Zuma for a schedule at either Tower 3,4,5,6, or 7. 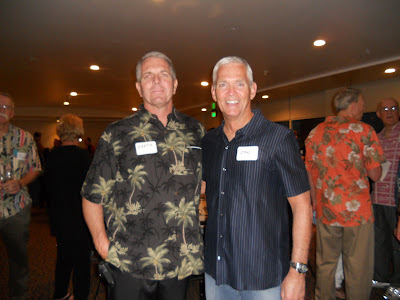 Bob"
"WE had just moved to the duplex and it was a day with very large surf and rip currents. Bobby had returned from the junior lifeguards program. It was late in the afternoon and the closest open lifeguard station was a good distance north of the house. Bobby noticed two people being swept out to sea in a huge rip current. They were screaming and “climbing the ladder”! He knocked the house phone off the hook, which immediately signaled to our headquarters switch board. I was doing the next weeks schedules and the switchboard operator commented to me, ”your house phone is off the hook and no one is answering”. Realizing that was a signal a tower lifeguard would do if he had to quickly depart his station for a rescue, I went to the observation area with the binoculars and spotted a yellow rescue can and someone heading out to sea with it. Then I noticed two victims floundering at the end a massive rip current. We radioed the beach unit to respond and dispatched the Headquarters emergency car immediately. The lifeguard from the closest tower hadn’t seen the victims... and when we called his tower to back up, he bolted out of the tower toward them. When both victims had been returned to the shore safely, I was notified that Bobby had made the initial contact, holding the two victims up, until the other lifeguards got to him and them He was only 9 years old at the time. He received from the County Board of Supervisors a commendation for Bravery and exemplified the value of the Junior Lifeguard Program. 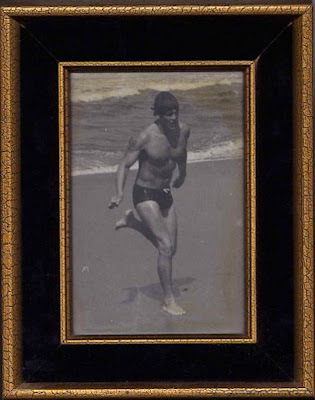 That season he also received the Outstanding Junior Lifeguard Award for the Northern Division... something he repeated for many years after, as his ocean skills were so outstanding." Many Thanks to Bob for sharing this great story about his son, Bobby, and for telling in perhaps the best way the value of the junior lifeguarding program. We also can certainly understand his personal pride at his son's valor and bravery at the age of 9 years old to have no fear or intimidation to brave the huge surf at Zuma. On a lighter note, "County Recurrent" surmises that this valiant effort by his son that day and the memory of it brings a tear (or two) to the Chief's eyes and continues to warm his heart even today. note: Per Nick, the photos were taken at "Zuma Beach 2004 in the afternoon on Labor Day flying with the Sheriff Helicopter and I spotted this Rip current and a rescue in progress with Scott Bernhoft and Clay Housley being the two Zuma guards involved." "Zuma was getting developed on our return from Europe. The parking lots and had expanded and the north end of the area was added with restrooms and a snack stand. The division had come a long way in 6 years. Our surf conditions had made a reputation for the area and its lifeguards. Consistently, our surf and rip currents were big and dangerous. 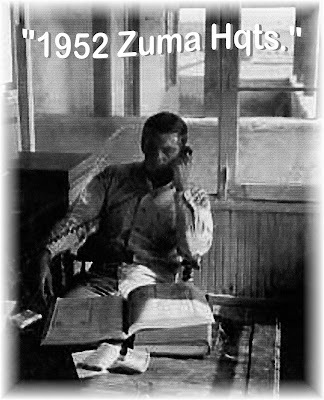 The Los Angeles Times often wrote articles about Zuma and displayed photos of the large surf and rescues. Times were changing and as acting Lieutenant, in the absence of the officers 4 days a week, I recognized that we just could not allow swimmers to put themselves into dangerous circumstances. In the 25 years at Zuma, which is considered the most treacherous public beach on the west coast... we only recorded “2” drownings... and each of those were under very unusual circumstances, and during minimum coverage periods." *** Many Thanks to Bob for sharing this excerpt from his biography about Zuma and its surf and rips and the evolution of preventative lifeguarding procedures. Also, Many Thanks to Nick Steers for these three compelling photos included herein which dramatically depict the rips at Zuma. "Ocean Lifeguards: Because Rips Happen !" "Here is one of the pictures I shot over Venice yesterday. 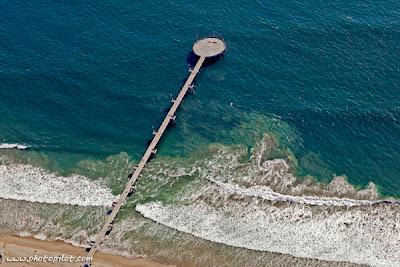 Besides the rips even the surf looked huge from the air." Keep shooting, Mark!... and we will keep posting them for our crew. Oh Yeah! North Beach, San Francisco, aka, the Italian neighborhood. There I was in a taxi in the back seat stopped at a traffic light and noticed this street sign! Wow! We encourage you to write in with what you know about this spectacularly named street or just make it up! 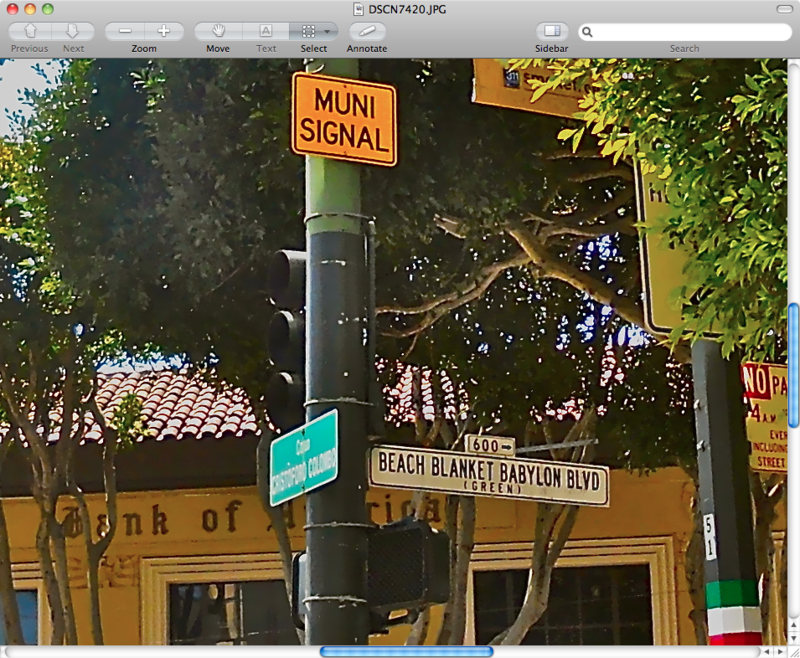 "Beach Blanket Babylon Blvd." Photo by & Copyright Will Maguire. All Rights Reserved. 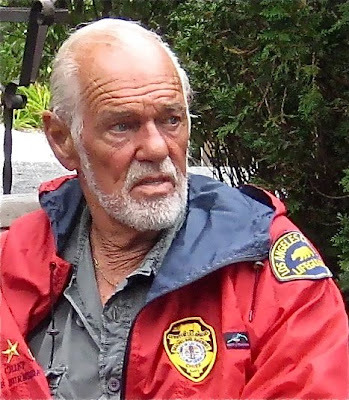 Thursday, May 20, 2011 around 11:30 a.m.
"County Recurrent" News is pleased to present an essay by B. Chris Brewster expressing his opinion regarding the topic of "Lifeguard Salaries and Benefits". Many Thanks to Chris for sharing his thoughts with all of us on this topic. The lifeguard profession has various incarnations around the country, influenced by issues like the level of water hazard, seasonality (or lack thereof), past experience with rescues and drownings, and the assigned tasks of lifeguards. For example, a full time, year-round lifeguard working for either the California State Park system or Volusia County, Florida, has a dual role as an armed police officer, with all of the roles and responsibilities of other peace officers in their state. It would be difficult to argue that they should receive less pay than other armed peace officers. Interestingly enough, a California State Park Ranger (peace officer) who is also a lifeguard makes no more money than a park ranger without ocean lifeguard skills, but must maintain the ability to swim 1,000 yards in 20 minutes or less, and all of the other responsibilities of a year-round lifeguard. Some lifeguards in Los Angeles County are paramedics, who perform essential services in offshore emergencies and on Catalina Island. They also staff a fleet of 32 foot, twin screw fire/rescue boats that effect rescues tens of miles from shore, depending upon the emergency. In San Diego, the full-time lifeguard staff are all peace officers (though not armed with firearms), and EMTs. They staff a 24-hour, 9-1-1 dispatch center. A minimum of four are on duty 24-hours a day. They handle dozens of cliff rescues each year, staff the fire-rescue boats for Mission Bay, handle boating enforcement on Mission Bay and up to three miles offshore, respond to offshore emergencies, partner with the San Diego Police Department to form the city’s dive team (including underwater search, recovery, and evidence gathering), and staff the city’s renowned River Rescue Team. That team is part of the national Urban Search and Rescue team network and was dispatched to Hurricane Katrina. These are just a few examples, highlighting some agencies. What has happened over the years in communities that have year-round beach activity and year-round lifeguards is that the lifeguards have shouldered related tasks, which might otherwise have to be handled by other emergency responders (police/fire) with less familiarity with water rescue. Lifeguards working in colder climates, where regular lifeguard duties are seasonal, typically do not have the same opportunities to participate as broadly in related public safety fields, since they are not available for response year-round. Lifeguards working full-time, year-round are typically compensated at a level somewhat similar to police officers and firefighters, although usually a little less. For example, in Newport Beach, a lifeguard battalion chief may receive a base pay of around $108,000, whereas a fire battalion chief may receive a base pay of around $141,000. To use San Diego as a further example, the lifeguard chief is at an equivalent level of a deputy fire chief. Both classifications have a maximum possible salary of $172,744. The lifeguard chief oversees a staff of 260 people, a 24-hour, 365 day a year response operation, and an annual operating budget exceeding $15 million. As a comparison, the entire operating budget of the City of Del Mar, California, just to the north of San Diego (population 4,389), is $19 million. The top base pay of a regular (non-supervisory) full-time lifeguard in San Diego is about $59,000. Recent media attention to Newport Beach is primarily due to the current nationwide political climate, wherein criticism of government is quite strong, combined with an unfortunate conflation of two mostly unrelated issues: pay and staffing levels. In April 2011, Newport Beach advised its year-round lifeguard staff that it would be cut from 13 to eight. This is highly concerning as the current year-round staff level was arrived at through years of experience in what was needed to ensure adequate safety in off-summer months. Consider the fact the Newport Beach is the home of the legendary Wedge, one of the premier bodysurfing beaches in the world, where waves up to 30 feet are sometimes present. Also, of course, there is year-round water attendance. As is the norm in Southern California, a seasonal lifeguard staff augments (and greatly outnumbers) the year-round staff in summer, with the year-round staff assuming a supervisory role. This reflects seasonality in beach attendance, which is much higher in summer, but nevertheless year-round. When lifeguards and lifeguard advocates pushed back against these reductions in service, a member of the Newport Beach City Council penned an op-ed in a local newspaper pillorying the year-round lifeguards with respect to their salaries and benefits. As noted earlier, these salaries and benefits are less than those of police officers and firefighters in Newport Beach, but her point seemed aimed at creating public animus toward the lifeguards and currying favor with certain political elements, to help further an agenda of cutting lifeguard protection. Thus the compensation of the employees was used as an excuse to reduce safety services for the general public, who have no direct control over those salaries. Beach lifeguard salaries in California, like those of other municipal workers, are arrived at via negotiations between cities and workers, typically represented by unions. In California, the Supreme Court has allowed strikes by public employees, with exceptions for strikes that create a substantial and imminent threat to the health or safety of the public (i.e. public safety workers). So elected officials in California typically may impose wages they consider appropriate and adequate without recourse from safety employees (other than to quit). The current pay levels of lifeguards and other public safety employees in California should be understood in this light. It is the representatives elected by the voters who determined the appropriateness of their compensation. Perhaps most importantly, this debate is distracting from a much more critical issue, which is that if the off-summer lifeguard staffing levels in Newport Beach are reduced by 38% as proposed, beach and water safety for the general public will be similarly lessened. My view is that beach lifeguards are public safety professionals and should be paid commensurate. Regardless, since Newport Beach lifeguard pay levels are set by the Newport Beach City Council itself, lifeguard pay is a red herring in this debate. The real issue here is whether lifeguard staffing for most of the year should be reduced by 38%. Since the current staffing levels are based on past history and demonstrated need, then unless that need can be shown to have declined or been improperly assessed, no change is justified. Copyright B. Chris Brewster 2011. All Rights Reserved. Posted here with permission. The opinions expressed hereinabove are solely those of the author. DISCLAIMER: County Recurrent is not affiliated with nor sponsored by LACOLA or LACoFD. The opinions expressed in the essay above by B. Chris Brewster are his own and are presented here in furtherance of the ongoing conversation on this topic. we hope the event continues to grow, while maintaining an unrelenting sense of soul that is a perfect reflection of the many contributors, collaborators, and volunteers that bring it to life. please do get back to me with any questions and or suggestions. DISCLAIMER: County Recurrent is not affiliated with nor sponsored by LACOLA or LACoFD or the SOUTHBAY DOZEN. Here it is! The Final Installment of Bob Burnside's article on the History of Junior Lifeguarding! The Junior Lifeguard Club (JLC) offered serious fun for kids 8 years and up who can swim at least 25m and tread water for 2 minutes. The Jr. Lifeguard Club provides an action-packed challenge for kids who love the water but who want more than "lessons." The Jr. Lifeguard Club is for quick learners, those between levels or programs who thrive in an energetic learning environment. Personal-best challenges: The JLC focuses on fun and developing skills using personal-bests to determine achievement - you don’t compete against anyone else but yourself. You can get better at your swimming skills, lifesaving skills, fitness, leadership, and teamwork skills. You can also train for competitions, and work on special events. Lots of recognition: No one "fails" in the Jr. Lifeguard Club. Effort and success are recognized with Recognition Seals when you meet personal goals, and set personal bests. Friends & family members can join together even if they are of different ages and abilities. The Junior Lifeguard Club is designed for a serious purpose but the process is pure fun. There is no "test sheet" in the Jr. Lifeguard Club. Every club member gets an Official Junior Lifeguard Club Water Log in which to record achievements and keep Recognition and Award Seals. The Canadian junior lifeguard program was piloted in the early 1990’s. It became a formal program throughout Canada in 1995 and remains one of the most successful water safety programs in Canada. For Surf Life Saving Great Britain, a junior was defined as anybody under 16. The few junior members were generally the kids of older members who had no choice but to follow their parents down to the beach, but there was little in the way of a structured program for them. In 1987, for the first time Great Britain put together a structured Youth Competition with age groups for 13, 14, 15, 16 and 17-19. There is now a fully established Youth Championships program using these same age groups. It soon became apparent that Great Britain needed to cater for those aged 12 and under. Consequently in 1991, the National Nipper movement came into being – its logo has always been the dolphin with the word Nipper across it as below. The Nipper program was launched at Dawlish Warren Beach, in South Devon with around 200 Nippers from clubs all over Great Britain. A local celebrity formally opened the event and 200 kids dressed in green tee-shirts and shorts and wearing green caps paraded around the beach. In the early days, the entire emphasis was based on fun and encouraging kids to participate. There was no formal competition to start with as it was felt important to encourage them to join, rather than put them off by engaging in a level of competition that they could not handle. Furthermore, it was important to manage the aspirations of their parents. This was achieved to some extent by encouraging the parents to join as helpers and support their clubs. Because of this parental involvement, many clubs experienced a significant increase in membership. This was essential to handle the number of Nippers that came to join up. From those early days a structured program of safety awards was developed and the whole concept of Nippers gained a Queen’s award for innovation. 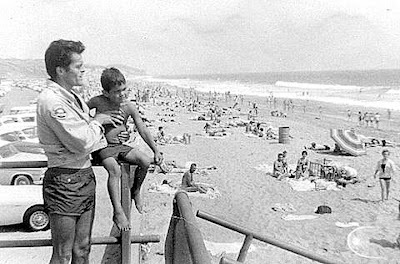 Through the Nippers, parents could ensure that their children gained a knowledge of safety at the beach, learned first aid skills and lifesaving skills that they would be able to take through life, and that the life of the beach and the local surf club was far more exciting than just being in a swimming club. The numbers of Nippers gradually increased, had doubled within two or three years, and now stands at around 1700 Nipper members from age 7 to 12. Soon, the Nippers themselves began to demand a level of competition to keep their interest. Without doubt the emphasis now is fully on competition, which is the activity that does most to draw them into surf clubs in the first instance. However, most Nippers stay in the program. They become Youth members from 13 and generally by the time they are 16 have such a grounding in surf lifesaving that they often go onto become professional lifeguards and strong senior members of their clubs. There are few people who have represented Great Britain in international competition during the last 10 years that did not start their lifesaving career as a Nipper. Without doubt, Great Britain’s Nippers are their lifeblood. Some clubs did not readily embrace the concept of Nippers, either because they just didn’t feel able to take in younger kids, or because they just could not be bothered. Those clubs struggled and most did not survive. Wherever the Nipper concept was fully embraced, those clubs have gone from strength to strength and in doing so have become an even bigger part of their local community. Nippers were a complete success for Surf Life Saving Great Britain, and had we not taken that step, our organisation would probably not have survived. SLSGB now caters successfully to anybody from 7 to 70 years of age, but without a doubt, the organisation is built upon Nippers. Hopefully, every beach water safety program will initiate a Junior Lifeguard Program for their community. Additionally, the success of the Mexican Handicapped Salvavidas, is yet another step for us all to consider, thus giving to the community yet another program for the handicapped. Without their help this material could not have been written. Chris Serb, Chicago Lifesaving Assn., Chris Brewster, USLA / ILF, Perry Smith, Canada, Victor Zavala, Mexico, Joaquine Venado, Club Tortugas / USLA, Jamie Nilsson, New Zealand, John Martin, Great Britain, Cal Porter, LACO, John Daly, USLA, & Reenie Boyer, USLA. Thanks Again to Bob Burnside for sharing this great historical storyline and photos regarding the Junior Lifeguard program here and overseas. "County Recurrent" Asks: Are you in shape for Summer?! It's the second week of May, people. Twenty plus days to Memorial Day Weekend 2011! Time to get in the pool and swim some laps and do some cardio on the treadmill, if you haven't been doing so as yet. Some stretching too in anticipation of wading and running and jumping in and out of those nasty spring inshore holes. Not to mention the annual rechecks are approaching rapidly. Unless you are under 21 years of age, you know you do not want to do that swim without some laps under your belt. You might make it to the first buoy but it will be a long slog back to the beach. Every year someone tries to pull it off without having spent some time in the pool and learns the hard way. Don't you be that recurrent! So start today, if you haven't already begun to get in shape! "County Recurrent" News wishes all Mom's a Most Excellent and Happy Mother's Day! Where and when did it start? Youth Training Program was formed in the 1940,s at Canterbury, North Beach Surf Lifesaving Club, South Island, New Zealand. 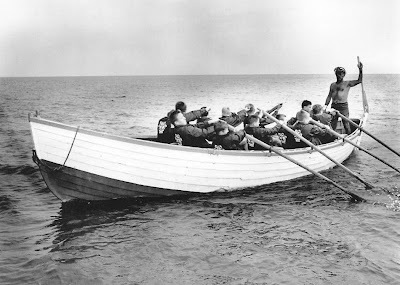 This was a basic course which train younger men to prepare for summer volunteer work with the surf club. In the 1960's, at South Brighton and Mount Mauganui Surf Clubs, the first “Nipper” program was established. New Zealand Surf Lifesaving Association’s National Body then established a true National Program for all Clubs to embrace in 1981. It was derived from a lifeguard manual that John Thomas wrote on his return from the first lifeguard exchange program between California and the Auckland Surf Life Saving Association. This program was initially developed by Peter Fitzsimmons and was known as the Metropolitan Life Assurance Youth Training Scheme. Mr. Jim Campbell, was appointed to coordinate and promote the project. By 1985, New Zealand had over 2000 Nippers. Competition for these youngsters, was not allowed until they reached the age of 14 years, thus ensuring that basic skills in water safety would be the main focal point. The history of the New Zealand programs, have been published by Ivan Jackson, author, in his book, “The Sand Between My Toes.” New Zealand’s Nipper program continues to grow rapidly with each passing year and has, like so many others, joined the community even closer to the Surf Lifesaving Movement and awareness of water safety. The first Mexican Junior Lifeguard Program, originated in the State of Oaxaca, Mexico at Puerto Escondido Playa. The United States Lifesaving Association’s, Club Tortuga, engaged in water safety development throughout Mexico. 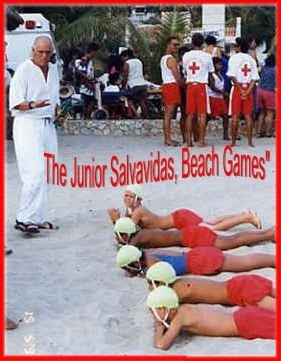 So, in 1996, the Club Tortugas established with the newly formed Salvavidas the first basic junior lifeguard program in Mexico. It was an every other day program run exclusively by the Salvavidas, and was warmly applauded by the community and became a major force in recognizing all the many things lifeguards had to offer the community they served. 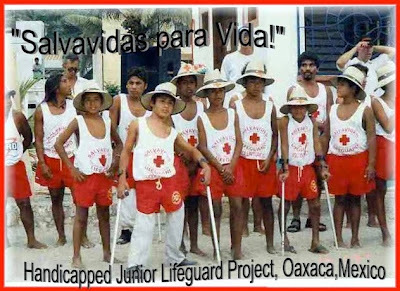 Thus, in 2001, the Oaxacan Governor's wife, Senora Guadalupe Murat, mandated an expansion of the Junior Lifeguard programs to the professional level and established funding for it and the entire lifeguard corps… This was a major step forward for Mexico, as it now became the first Government subsidized lifeguard operation… that encompassed training juniors lifeguards also. The idea of a Junior Lifeguard Program in Tijuana started in 2007, following the Oaxacan program; some Tijuana Lifeguards participated in the JG Programs of several Southern California lifeguard services (Imperial Beach, Silver Strand and Coronado). The 2008 Tijuana JG Program exceeded their expectations and in 2009 they are ready to accept up to 60 participants from 9 to 16 years of age. The program is a safe and fun way to teach the participants swimming, lifeguarding and first aid skills along with information on how to respect the beach and the ocean environment. Hopefully some of the participants will become lifeguards in the future. Participants must swim 100 meters, float 5 minutes and swim 9 meters underwater. *Added note: Mexico becomes the first Nation to establish Handicapped Junior Lifeguard Program. In 1995 ,Joaquine Venado, The Club Tortugas/USLA, Oaxacan Liaison to that group’s outreach programs, accepted the position to develop a new programs in the region. During this period with the help of Ana Johansen, the director of the Pina Palmera Disabled Children’s Hospital in Zipolite, he developed the world's first disabled Junior Lifeguard Program with Pina Palmera Children's Hospital, and established the first Mexican Lifeguard Championship at Zipolite Beach. During the Category 5 Hurricane Pauline, in 1997, which devastated the coastal areas of Oaxaca, these young Salvavidas that had finished this initial course, saved 20 children that could not walk or who were too young to escape from certain death. They received a States commendation for their heroic efforts. The Club Tortugas continues to support the concept, for all nations to establish a Handicapped Program, in conjunction with their regular Junior Lifeguard Programs. JD Moryl Issues Formal Response! JD Moryl has issued a reply to our blog post regarding his previous demand for a retraction. CORRECTION: First, however, we did misquote JD's current weight, which is 165 pounds (not 150 pounds); and his previous weight was 175 pounds. 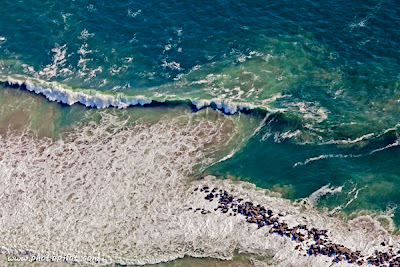 RIP CURRENT AWARENESS WEEK (RCAW): June 5 - 11, 2011. The First Full Week of June Every Year! II. This event has also been added to the USLA Calendar. III. "County Recurrent" News is also supporting this effort! p.s. some additional shots of some rips along Santa Monica South between Towers # 22 - 24... just for the fun of it and to keep all you Recurrents sharp!... and in case any permanents are reading this blog post, here are some photos to remind you all what rips look like... woo hoo! JUST KIDDING!!! Retired Section Chief Jon Moryl Demands "County Recurrent" Retraction! "Finally, for the man who declared he would never swim a lap again upon retirement, I look forward to seeing your increasing waist line !" Retraction Demand: At the recent retirement party for Assnt. Chief Phil Topar, JD demanded a retraction of the "County Recurrent" statement several years ago at the time of JD's impending retirement that JD would likely gain innumerable pounds and put on alot of weight given JD's pronouncement face to face with the Editor of "County Recurrent" News that, "Once I retire I will never swim again!" Having heard this remarkable statement firsthand, the editor of this blog conjectured, most reasonably, that JD would gain weight. Jump forward to April 2011, JD is happily retired and continues to swim regularly. In fact, he is at his high school weight of 150 pounds, which is some 15 pounds less than JD was at the time of his retirement (see photo below). So we ask our readers..... Given JD's absolute and unqualified declaration that he would never swim again, should "County Recurrent" News issue a retraction for its reasoned speculation that JD would gain weight post-retirement? In 1969 the first nipper squad was formed at Pirates Surf Lifesaving Club and was also the start of the first Basic Nipper Course, designed to teach young boys and girls the fundamental principles of surf safety. The first Basic Course for the Nippers attracted a total of 200 youngsters, eager to learn. On completion of the course, the Nippers were examined and successful candidates received a certificate and a badge. This entitled them to enter the Intermediate and Advanced courses. After successfully completing all three courses, at age 15 they are then able to train to become Junior Lifesavers and can begin doing patrol duty on beaches. Lifesaving South Africa’s Nipper movement was founded in 1972. Surf Nippers now boasts a membership of over 1200. Stillwater Nippers started in 1994 and has over 500 members. The Nipper activities have become one of the most successful child development and sporting programs within South Africa. The important prerequisite to remember is that Clubs do not undertake to teach the "Nippers" basic swimming. On joining they are tested on their swimming ability and then encouraged to join swimming clubs in order to improve themselves. The Lifesaving Clubs’ main function is to teach the youngster respect for the water and give them confidence in the aquatic environment (especially the sea). No Nipper, however, is allowed to be part of the voluntary patrols, which do duty on our beaches. By having the Nipper Sections in our movement, a greater parental interest has developed and parents are often involved in the fundraising and administrative duties of the clubs. The Nipper movement is completely voluntary and relies on public contributors to cover all expenses. "Nippers’ in surf life saving"
In response to declining membership lists and deteriorating club life in the mid and late 1960’s, many clubs launched recruitment campaigns aimed at a new category of member, pre-adolescents known as ‘nippers’. 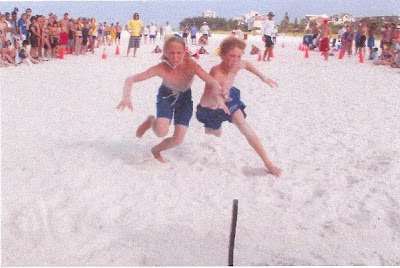 Clubs believed that nippers would graduate into active members and, with more sporting experience, improve their competitive profiles. Youth sections actually have a long history in the movement – Cottesloe recruited sub-juniors (juveniles) in the 1930’s and a number of clubs followed suit in the 1950’s – but the nipper program in the 1960’s was far more extensive and actively encouraged by senior SLSA officials. These days’ junior activities continue to grow at such a rate that some clubs have even had to cap their numbers to be able to cope. The focus of nippers has changed over the last decade from what was a more competitive focus to more of a balance between lifesaving and competition. Of SLSA’s almost 140,000 members, almost 50,000 are nippers (5-13 years). This is roughly 36% of our total membership and shows just how significant the junior movement is within Australian surf life saving. The nippers of today are the future of surf life saving, and this is not lost on the thousands of volunteer Age Managers that provide support and instruction in junior programs during the summer. "County Recurrent" is pleased to bring to our readership a new 8-part article by LACo Chief Lifeguard, Bob Burnside (Ret. ), which we will be presenting 2 parts at a time. "Recently, the Southwest Region California Surf Lifesaving Association of the United States Lifesaving Association approved an award, for the “Outstanding Junior Lifeguard” in California. It will be presented to that individual who has met the highest standards of the J.G. programs, as established by the CSLSA. The award will be annually presented to the Chapter from the CSLSA. and the individual honoree. As I look back over the many years of water safety, the questions of… Where, Who and Why did this magnificent program arise? I recall my Chief “Rusty” Williams of the Los Angeles County Lifeguards, while touring Australia in 1956, as the U.S.A. representative to the Olympic Surf Carnival at Torquay Beach, Melbourne, Victoria, discussing with his Australian counterpart, Ken Watson, the Junior Lifeguard Program and its success in the U.S.A. After the International Championships, the subject was again discussed in detail with the Australian Association’s President, the Honorable Judge Adrian Curlews. Years later, Australia initiated their “Nipper” program, which will be addressed later in this article. But who really had the “Idea” of such a great program? It has taken me a little while to trace the time frames and information from our national level, …and a lot of time gathering facts from the international brotherhood of lifesavers. As you can imagine, a lot of groups might wish to claim title to the concept and earliest startup. Additionally, little research has been done on this and many just assume, due to institutional pride and knowledge, that they were first. So just what are the facts from history that can be verified, at least at the moment? So let's start down this path of the History of the "junior Lifeguards" origin. The earliest document evidence of the start of the Junior Lifeguard program came out of Chicago, Illinois’s, U.S.A. In the 1910s, Tom Daley’s City Lifeguard Service was operating on a shoestring budget, even as Chicago’s beaches and recreational swimming in general, became more popular. Soon there were not enough lifeguards to cover the activity. World War 1 and the great influenza epidemic, made the numbers crunch even more serious. Leaving the beaches uncovered or understaffed would lead to more accidents and deaths,..as the City of Chicago just didn’t have the funds to hire more lifeguards, nor train potential recruits. In 1919, Daly came up with the solution to the problem: …Let’s establish a “Junior Lifeguard” corps to help patrol the beaches. …The first junior lifeguards were a loosely organized group of boys who would help watch a certain area of beach, both before and during the busy hours. They would alert the few lifeguards on duty when they spotted any problems. As a reward, for the service, the junior lifeguards where given trunks and T-shirts and had the opportunity to use all the lifeguard equipment for extra training. As the program grew, Superintendent Daly, organized junior lifeguard programs throughout Chicago’s beaches and pools, with moderate success. Much of the foregoing history has been obtained from the book “ Sam’s Boys,”, written and published, by Chris Serb, retired Chicago Lifeguard, about the history of Chicago’s lifesaving and the legendary lifeguard Sam Leone. Within this great book, the many stories of the early junior lifeguards of Chicago are documented with factual accounts and photographs of the earliest junior lifeguard program in the world. It is a very informative and fascinating book that should be of interest to all lifesavers. In 1927 the Los Angeles City Beach Lifeguards established the first Junior Lifeguard program in California. The group was organized and trained by lifeguard, Bob Foster. Members of that first group included Ed Perry who later became a long time rescue boat skipper, and whose son also became a lifeguard. Another member was Lawrence McNulty, top left in the photo, whose son and grandson became lifeguards. The group trained at the original LA City Lifeguard Hqts. at Brooks Ave Beach, in Venice, within the city of Los Angeles coastal areas. 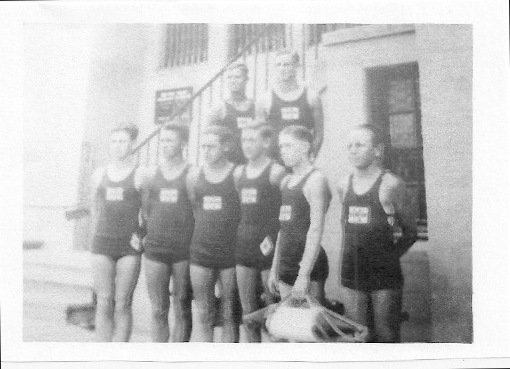 Attached is a photo of the first LA City Junior lifeguards, photo 1927, with Ed Perry far right. The L.A. City’s Chief Lifeguard, Myron Cox, loved working with young people. Through his efforts, and perseverance, the Los Angeles Parks and Recreation Dept. established the project as an annual youth program for the children of Los Angeles. In the South Bay Area, of Los Angeles County, the L.A County Lifeguards had begun staffing their Headquarters in Hermosa Beach as a year around 24/7 operation. The wartime needs for coastal observation and emergency response to the residence of the south Bay area now became the responsibility of the lifeguards. Lifeguard Jim Neves, having been at one time, also a professional wrestler with Chief Myron Cox, became familiar with the City’s junior lifeguard program. Each morning Jim would go off duty a 7 a.m., as the day crew came on duty. He had noticed a group of the young locals kids playing early on the beach. He approached L.A. County’s Chief Williams with the idea of putting together an exercise and water skill program for the kids, similar to that which L.A. City Lifeguards had established. The Chief gave the go ahead, …and thus the second recorded beach junior lifeguard program on the West Coast had started at Hermosa Beach Pier…and later to be followed by other California agencies. Today…. almost all California Beach Communities have a Junior Lifeguard Program deep in tradition. There is a California Regional Junior Lifeguard Competition hosted by the CSLSA every July where approximately 3,000 elite Junior Lifeguard competitors swim, run, flag and paddle for honors. Junior Lifeguard programs are represented in every Region of the USLA. Every summer in the first week of August there is a National Junior Lifeguard Competition hosted by the USLA where approximately 1,000 Junior Lifeguards compete for the national title. Long Beach, New York is a barrier beach off of Long Island, approximately 10 miles in length and 1/2 mile at its widest point. It is connected to the main part of Long Island by 3 bridges. The community is diversified and consists of about 40,000 residents full time. It is accessible by train from NYC, which is 45 minutes away. In 1978 we toured the west coast beaches, after the USLA Nationals for the first time and viewed the Jr Lifeguard programs at Huntington and Newport Beaches. In 1983 we lived in Australia and observed their nipper program. It took a while as our beach structure was getting more professional and we realized we needed a Junior Lifeguard program to help continue a high quality of staffing of professional lifeguards in our town. Each time we were on the west coast for a competition we visited the Jr Lifeguard programs. We decided to start a program for the summer of 1988. We had a banner made by an art teacher from our school and invited several lifeguards, including Joe Hoffman,and his brother Ed ,my brother John Daly and my wife, Rosemary, All volunteers to help run the program. We had 12 boys between the ages of 10 and 12. Mostly the sons of friends who were lifeguards. We had one BZ surfboard donated by another lifeguard and we were in business. The program grew the next year to 25 boys and girls and we added more volunteer instructors. We met on Saturday and Sunday mornings from 10-12 . The program has increased in popularity in town as we are the only organization that actually teaches young boys and girls water safety and how to swim in the ocean along with lifeguarding skills. Today we have increased the program with almost 300 boys and girls and 25 instructors. Our core of lifeguards have come from this introductory program. We still only met two days a week, and have incorporated our knowledge from the beaches that we have visited. Since that time beaches in New Jersey and other parts of Long Island have started programs. 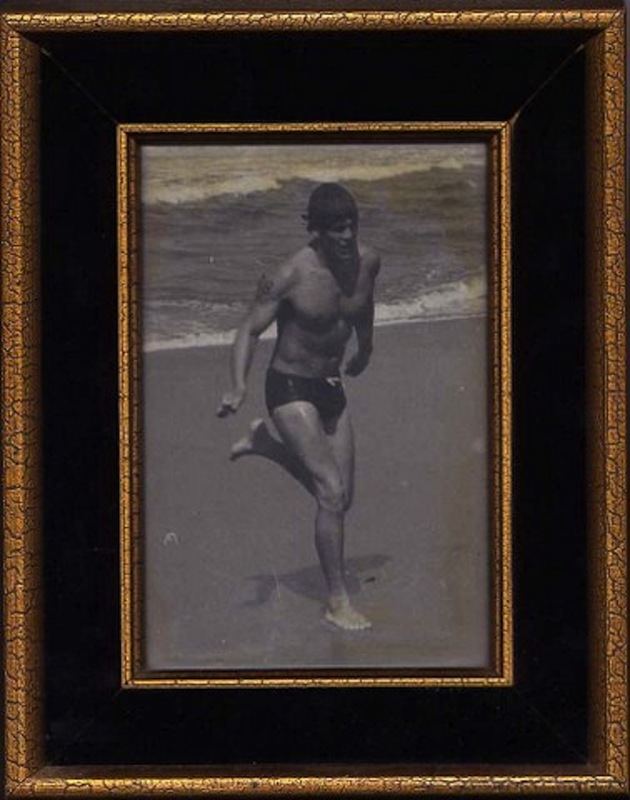 *** Stayed tuned as we continue to publish this remarkable historical record of the beginnings of the Junior Lifeguarding program written by Bob Burnside. Many Thanks to Bob for sharing this article with all of us!